Osinbajo’s signing of budget Commendable — Don – Royal Times of Nigeria. A don, Charlse Nwaekeaku, on Tuesday, said the signing of the 2017 budget by Acting President Yemi Osinbajo was a welcome development for the country. Nwaekeaku, an Associate Professor and former Head of Department, Public Administration, Nasarawa State University, Keffi, told the News Agency of Nigeria (NAN) that the decision by the presidency was highly commendable. believe that government is a continued process and should not have any vacuum. The don, however, advised the Federal Government to ensure diligent implementation of the budget to improve the country’s economy and alleviate the sufferings of the people. He said that in the past, the Nigerian budget was hardly implemented, adding that “for most Nigerians, the budget is a mere ritual, but we hope that this one will be an exception; we hope that this budget will be implemented as appropriated. The Acting President, Prof. Yemi Osinbajo, on Monday, signed the 2017 Appropriation bill into law. The budget, which was presented to the two chambers of the National assembly in December 2016, was passed by the National Assembly only few weeks back. It had an estimate of N7.28 trillion but was raised to N7.44 trillion by the federal lawmakers. The signing of the budget was witnessed by some members of the National Assembly, the Chief of Staff to the President, the Head of Service, some ministers, among others. 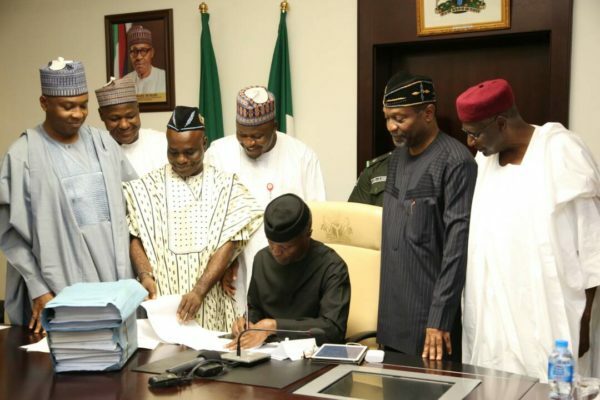 the signing of the budget by Acting President Yemi Osinbajo, saying it was in the interest of the nation’s economy.